Discussion in 'News and Announcements' started by Roshen, Jul 23, 2015. The plan for TLE servers is to shoot for maximum nostalgia. Stormhold (PvE) and Deathtoll (PvP) opened to players on Tuesday, July 21, 2015. There will be many features that will not be available to players during the TLE launch, and some features will never be available, especially for PvP. PvP server: Travel bells are restricted. There will only be ground mounts and they will have reduced ground speed. The highest mount speed on these servers is set at 29%. Content will be locked to classic EverQuest 2. Starting areas are Outpost of the Overlord and Queen’s Colony. Loyalty System and daily quests are locked to Chains of Eternity expansion. All races are playable at launch. Players still need to purchase races they don’t own if they’d like to play Aerakyn and Freeblood. Beastlords are locked to Age of Discovery and Channeler’s are locked to Tears of Veeshan expansions. Marketplace will be highly restricted and polls will be done to determine what will be available.Experience potions will NOT be available at launch, but we will be adding them in later. What are the AA and level caps, levels and restrictions for the PvE and PvP Servers? There are going to be decisions to be made, and we’ll collect your feedback through in-game polls. We will add poll questions as decisions come up that we deem important for the player base to determine. Players will have the option to vote to unlock content every 30-days. The voting period will last a week, and it will take a majority vote of 2/3 (or more) of the server votes to unlock the next expansion. If the server votes not to unlock the next expansion, the vote will start again after 30-days. Through player polls, expansion unlock votes, and your feedback with us on the forums YOU control the destiny of Time-Locked Expansion servers. We’re excited about these servers, and we can tell that you are too! We’ll see you in-game on Stormhold and Deathtoll. Seefar, Xillean, Spindle and 4 others like this. Thank you for an in-depth look into the TLE future! thank you for all this info this helps a lot , especially because there are still ghosts of the future expansions floating around the locked servers. But I must say I am enjoying myself nether the less. I am overjoyed to be able to play like when the game first came out even if its not exactly like it , heck close enough. I also never saw a game so alive I love it . WaxLyrical, Seefar and HaphazardAllure like this. My additions to frequently asked are as follows. Hope others will post more, because this barely scratches the surface. How? - Use the world bell in your home city. I'm evil, how do I get to Frostfang Sea for the crafting quest? - You must get to the Nektulos Dock world bell, then go to Thundering Steppes. 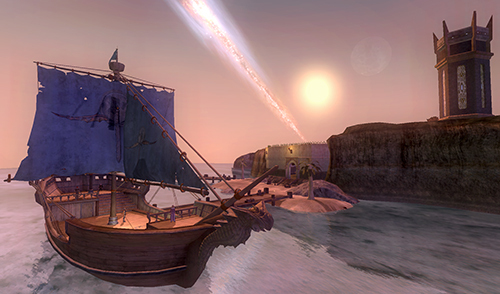 Run through Thundering Steppes to Antonica where you can take the griffon over to the docks. The world bell on the docks there will let you zone to Frostfang Sea. It's not maximum nostalgia without subcombines and lower-quality crafted items. Bring back the WORTs! So far I have enjoyed the new servers. Wish I had known about the slow mount speed before buying one. GrunEQ and Seefar like this. GrunEQ, Xillean, Sydnye and 5 others like this. The return of Queen's Colony/Isle of the Overlord is more incentive for me to try these new servers than anything else said about them. Any chance you'll return them as options to the Live serves as well? Adevil, I thought both Darklight Woods and Freeport had their own versions of the Learning to Harvest/crafting starter quests? For that matter, I know Qeynos does on live - in Oakmyst for harvesting, in the NQ crafting building for the crafting starter. Can't seem to log on right now, so can't check the others for myself. Are Frostfang Sea and Darklight Woods even available? We got those with later expansions. They weren't part of the original EQ2. The quest I linked lists the locations of all 6 of the quest givers. Of course the Kelethin and Gorowyn ones won't be around for a while, but the other 4 are ingame. Edit: It's the T2 crafting quests that only exist in New Halas. They give T2 rares and unlock the vendor for the T2 advanced books. AriaInEbony, Seefar and Guntharr like this. “The quest I linked lists the locations of all 6 of the quest givers. Of course the Kelethin and Gorowyn ones won't be around for a while, but the other 4 are ingame. I have an AllAccess Account but can only Play on Valor... What must i do to Play on the Time Locked Servers? Change your region to US English, not EU English. Then when you create a new character, it will ask you to choose either normal server or time-locked. (To change your region, login in to the launch pad as usual. Before pressing the green "Play" button, look to the top left hand corner and you will see "Version" - click on the words to change to US English version (region) and then you will go through a short patch, and then you are in the US region). I know it's still early but you should tie the lvl 92 and Skyshrine content to Age of Discovery expansion rather then DoV. Original DoV content was lvl 90 with the increased aa cap to 300. Jumping straight into lvl 92 would invalidate lots of original DoV heroic and raid content as SS will yield way better rewards. Even tho i hated vanilla DoV especially due to screwed itemization, Drunder was kinda fun. On all TLE: Please please please no mercs, no dungeon finder, no xp pots, no vitality, NO EZ MODE!!! Gramma and Bloodfang like this.